The living room is one the most used spaces in your home. From watching TV to hanging out with your family to entertaining guests, your living room has many purposes. Create a space that's both comfortable and stylish with these 50 budget-friendly DIY projects. Save money furnishing your living room by DIYing a sofa. Reupholster your old chairs with leather with these DIY covers. These handmade slipcovers are the perfect way to change the color of old chairs to match your sofa and decor. Making a giant abstract painting for your home is easier than you might expect with this simple DIY. Keep extra blankets within easy reach with a beautiful copper blanket ladder. Add some tropical flair to your home by hanging some pineapple pendants. Cluster a few of the pendants together in your living room for a specular DIY light fixture. Making a hairpin coffee table is very simple, and it's a quick way to update the look of your living room. Create a bold focal spot in your living room by painting a plaid wall. Display a small plant in your living room with a DIY copper and marble plant stand. Large rugs can often be expensive, so make your own for the living room instead. Build an affordable coffee table with a few boards of wood stacked together. Take your old Ikea table top and replace the legs to create a mid century style table perfect for your living room. Add a splash of color to your neutral furniture with a handmade pillow. Add extra storage space with this DIY ladder shelf, where you can display photos and books in your living room. Wrap your old chair legs with gold adhesive vinyl to give your chair a new look in minutes. Give your sideboard a makeover with paint to create a media center for your living room. This basket planter is an excellent way to add extra texture to a room. Get the look of a marble table for less by using contact paper to cover your existing coffee table. This clever project is perfect to hide scratches on the surface of your current table. Bring the outdoors in with a tree stump side table painted with an ombre finish. The best thing about this project is you can make it nearly for free by using a tree stump, paint and polyurethane. Add extra storage to your living room by constructing a narrow under-the-sofa drawer. The pull-out drawer is perfect for storing blankets or magazines next to the couch. Build a sturdy cement side table that is perfect for keeping your drink or snack within easy reach. Hide your streaming device with a minimalist cover you can DIY. Freshen up the look of a chair by painting a graphic design on it. The painted design can also be an excellent way to hide existing tears or stains on the fabric. Give a makeover to your bookcase by raising it up with small furniture legs. Combine a marble tile and hairpin legs to create a chic table for your home. During the summer when your fireplace is not in use, enhance it with a decorative faux log stack that you can craft. Make a stylish throw pillow by adding gold studs to the front of your old cushions. Hang these stunning color blocked mirrors with a galaxy design on one of the walls in your home. Give your old lamp a makeover with contact paper. This quick project is the perfect way to make your old lamp look like new. Print this "always weekending" artwork, which you can frame, for some free wall art to hang in your living room. For a chic makeover of your old Ikea nesting table, spray the base gold to give it a new look. Use paint to give your old television console a modern makeover. This is an affordable update that could make a big visual difference in your living room. Bar carts are very trendy in home decor right now. Add one in your home to keep all your cocktail essentials ready for your next gathering. Give your record player a bold new look with patterned wrapping paper and colored vinyl. Cover a large cable spool with a second-hand fur coat to make a comfortable ottoman. Add a side table beside your sofa by converting Ikea's round chopping board into a small table. Convert that old table you have stored in the basement into a tufted ottoman. Do you love to make cocktails at home? Repurpose an old piece of furniture, such as a record player stand, and convert it into a bar cart. Display your vinyl collection with a DIY rack that can hold up to 25 records. Put your feet up after a long day of work with a crochet foot rest that is perfect for the living room. Add some extra seating for guests with a DIY floor pouf that can also be used as a footrest. Add an extra light source in your living room by hanging a metallic wall sconce. This simple-to-build daybed works as a couch and can be used as a guest bed too! This sofa is perfect for small apartments where you are tight on storage space, as it has built-in storage. ​​​Raise your potted plants off the floor with some handmade modern plant stands. For an inexpensive piece of art, frame a giant tropical leaf that would look perfect in your living room. Add some extra greenery to your home by hanging a DIY planter from the ceiling. 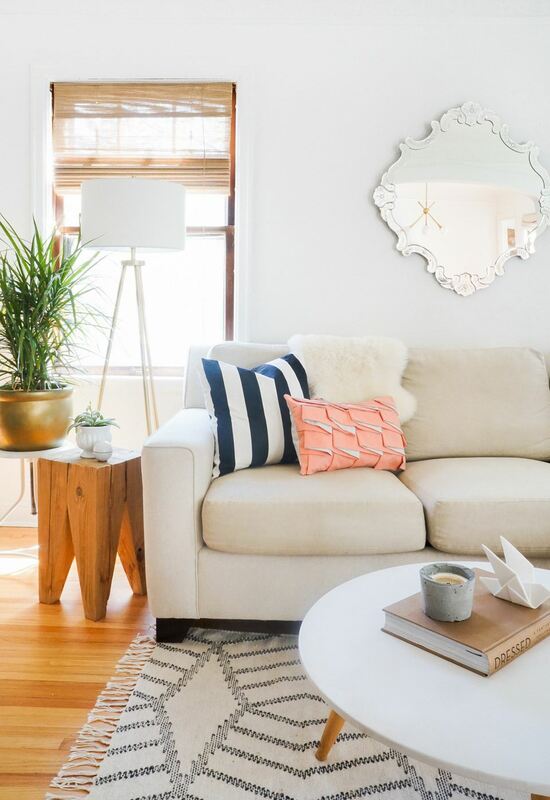 Add some color to your living room by clustering together several painted mirrors. Keep warm while you watch Netflix or read a book in your living room with a cozy tassel blanket. Add some color to your couch with a few handmade color blocked pillows. This weekend, try adding furniture legs to a table top to make a new piece of furniture for your home.